Can There Be a Global Microhistory? This is the question behind the AHRC Global Microhistory Network, which held its first conference at the University of Warwick on 17-19 May 2018. The conference was entitled A Different Point of View: Scales, Spaces and Contexts in the History of the Local and the Global. It consisted of a combination of empirical and methodological papers that examined ‘the global framing of the local’, to quote from the conference blurb. In this post Dr Michael Bycroft summarises the main themes of the conference; this will be followed by a second post in which he offers some opinions on them. Why does this project matter now? The conference threw up three answers. One answer, given by Maxine Berg in her pre-conference reflections, is that global history is getting too big: ‘The early initiative of global history arose out of histories of the economy, resources and the environment, and the result has been the accumulation of large data sets and large comparative projects across time and space.’ An example is research on the evolution of standards of living, where economic historians use data on wages and prices to track the purchasing power of individuals across centuries and even millennia. The third answer is that global historians must rethink their field in response to the rise of nationalist and nativist movements in recent years, and in particular to the electoral success of the Front National in France, the Brexit campaign in the UK, and Donald Trump in the US. These events show that nationhood and border-building matter a lot to many people. This is a challenge for global historians who believe that networks matter more than nations and that border-crossing matters more than border-building. We have been carried away by ‘borderless, do-good storytelling about our cosmopolitan commonness’, as Jeremy Adelman argued in an essay published in March 2017 in Aeon, an online magazine that is itself committed to the spread of 'cosmopolitan worldview', according to its tagline. Adelman gave Lynn Hunt's Writing History in the Global Era (2014) as an example of the view that global history can produce more tolerant citizens, and Sanjay Subrahmanyam as an example of someone who put this idea into practice by writing 'histoires qui bougent', or 'connected histories.' (Adelman provided further explanation on his online essay at a Warwick Global History Reading Group session in November 2017, the contents of which have been summarized here). In sum, this conference was meant as a departure from (for want of better terms) large-scale or macro global history, American global microhistory, and cosmopolitan global history. The antidote to these kinds of history is, respectively, more small-scale history, more methodological reflection on our microhistories, and more attention to local attachments. These goals are not identical, but they do overlap: both Trivellato and Adelman are wary of overly optimistic cosmopolitanism; both Berg and Adelman say that small places need more attention. One challenge of the conference was to weave together these three different points of view. In her 2011 paper, Trivellato explained that Italian microhistorians in the 1970s and 1980s had been interested in methodological questions such as how to write about multiple contexts at once, how to use fragmented sources without over-interpreting them, and how to develop comparisons from rich descriptions of individual cases. Trivellato expanded on the latter topic (comparisons) in her talk at the conference. Fittingly, she did so by giving rich descriptions of some major historical works and then developing comparisons between these works. These works included classics in global history such as Kenneth Pomeranz’s The Great Divergence (2001), as well as more recent works such as Jane Burbank and Frederick Cooper’s Empires in World History (2011). The key point to emerge from these examples was, as Trivellato put it, ‘there was an earlier attempt to do this.’ We are not the first to try to reconcile microhistory and macrohistory, and there is much to learn from earlier efforts. Trivellato wanted to show ‘how we can build our models from the bottom up.’ This led one participant to quip: ‘I like everything that is built from the bottom up, except models.’ In the roundtable discussion, one speaker gave an eloquent defense of the ‘close reading’ of documents in multiple languages. One should not assume, for example, that a diplomatic letter translated into Portuguese has the same meaning as the original document in Persian or Arabic. Someone protested that the call for ‘close reading’ sounded too much like ‘extreme vetting’, i.e. a vague insistence that we do more of something that we do anyway. This protest was not quite fair – reading multiple translations of the same document is a specific technique, not a vague one. But the protestor was surely right to say that close reading is not sufficient. Historians, like in all other inquiries, need some sort of conceptual scheme to make sense of their data. The concluding discussion threw up various proposals for what this conceptual scheme should look like, most of which had emerged in the presentations in the preceding two days. ‘Social practices’ was one proposal. The theme of ‘belonging’ was another. One panelist used the phrase ‘major transformations’, a reminder that historians, more than most other researchers, are concerned with large-scale change over time. Time became a talking-point at the conference after talks by Adrianna Catena and Maxine Berg. Catena was interested in a particular stage in the adoption of New World dyestuffs in Europe, namely the early period of conflict and confusion before the dyes were widely accepted by artisans and consumers. One lesson from the talk was that this stage occurred in different decades in different parts of Europe. Later the same day, Berg spoke about encounters between Europeans and the Mowachaht people of Nootka Sound, on Vancouver Island, in the closing decades of the eighteenth century. This talk drew questions from the audience about first encounters (were the ‘first’ ones really the first?) and simultaneity (when we say that many different things happened in the same year, or at the same time, what do we mean?). Other commentators agreed that global historians had not yet grappled with the time variable, and that it was high time we did so. Berg’s paper on Nootka Sound illustrated one way to give a global frame to the local. Berg examined a small, apparently isolated place and tried to fit it into a bigger picture. Other speakers took the same approach, e.g. Anne Gerritsen in her study of a temple on a lake in northern Jiangxi Province in China, and Christian de Vito in his study of a military outpost on the Falkland Islands. All three speakers examined a node in a large network, but they took this metaphor in different directions. Gerritsen thickened the network. 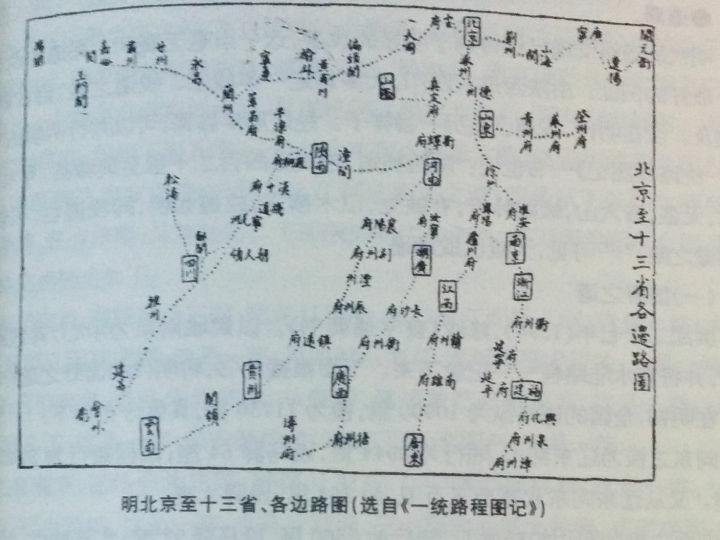 She showed that the temple was part of several different networks that were active in the same part of northern Jiangxi Province. These networks were distinct but covered roughly the same area; Gerritsen compared them to the strata on a geological map. Berg thickened the node. She showed that the Mowachaht people had robust notions of sovereignty and property rights that they upheld even as they became involved in a sea-otter trade that linked Asia, Russia, Spanish America, and Europe. Finally, De Vito merged the node and the network. The military outpost in the Falklands was defined almost entirely by its connections to other nodes in the network, which in this case means other places in the Spanish Empire through which convicts were transported in the late eighteenth century. De Vito raised a few eyebrows by saying that historians should abandon our talk about scales. He argued that, when we talk about scale, we are bound to reinforce the distinction between the local and the global and between agency and structure. And aren’t those the very distinctions that we are trying to get away from at this conference? I followed this up with a talk explaining why we should talk about scales. My point was that we can link up the microscale of a single mineral collection with the macroscale of global trade by running through the intermediate scales, such as the city, the province, the nation, and the empire. Despite their differences, these two papers were getting at the same point, namely that scales look different to different historical actors. ‘The national scale’ and ‘the regional scale’ mattered little to the convicts in De Vito’s story, since their lives were made up of tiny encampments and long journeys on foot or by ship, neither of which had much to do with regions and nations. Nations and regions did matter to the merchants and naturalists in my research, however, since these were the geographical units that determined the value and classification of precious stones (‘Persian’ turquoise was good, ‘French’ turquoise bad, and so on). There is another way to express this point, in terms of the ‘metrics’ that different people use to determine how big a space is, or how far one place is from another. But this thought belongs to the next post, in which I offer some personal reflections on the main themes of the conference. Dr Michael Bycroft is Assistant Professor in the History of Science and Technology at the University of Warwick. A historian of early modern science, technology and medicine, he focuses on the connections between France, the rest of Europe, and the wider world. The theme of Michael's research is knowledge: how people acquire it, how they defend it, and what they do with it. As such, Michael connects the history of ideas to economic, political and technological history, and to the history of art. He is currently preparing two books on precious stones in the early modern world, while also working on a new project on materials testing in early modern France. Francesca Trivellato, ‘Is There a Future for Italian Microhistory in the Age of Global History?’ California Italian Studies 2, no. 1 (2011). On ‘global microhistory’ see section VI, and on Sanjay Subrahmanyam see section IX. Cf. Francesca Trivellato, ‘Microstoria/Microhistoire/Microhistory,’French Politics, Culture & Society 33, no. 1 (2015): 122–34, esp. 131 (Subrahmanyam). Subrahmanyam draws inspiration from Italian microhistory in two influential articles: ‘Connected Histories: Notes Towards a Reconfiguration of Early Modern Eurasia,’ Modern Asian Studies31, no. 3 (1997): 735–62, on 750 (‘Carlo Ginzburg’s celebrated miller’); ‘Hearing Voices: Vignettes of Early Modernity in South Asia, 1400-1750,’ Daedalus127, no. 3 (1998): 75–104, on 78, note 102 (reference to a volume on microhistory edited by Jacques Revel, whose work as a microhistorian prompted Trivellato’s 2015 paper). 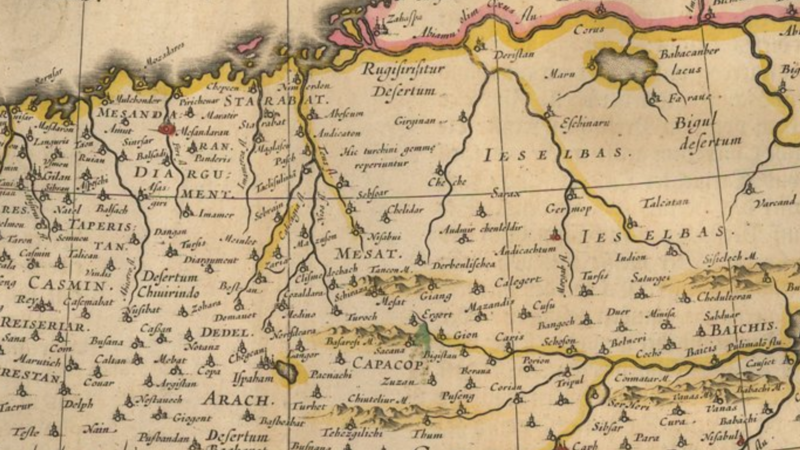 Detail of Willem Blaeu, Persia sive Sophorum Regnum, Amsterdam, 1635, showing (upper-centre) the presumed location of turquoise mines (‘Hic turchini gemma reperiuntur’) and the town of Nishapur (‘Nisabui’). The yellow border is that of Persia.